If you ever need a wedding ring for a math nerd, you might want to look into a very patient jeweler who can make a convincing version of Alexander's Horned Sphere. The jeweler could never make a perfect version, but that's because the Horned Sphere is a fractal, an infinitely repeating pattern. The best way to picture making the Horned Ring is looking at your hands. Bring your finger and thumb close, like you're almost making an 'okay' gesture. Stop a bit before they touch. From the side of each fingertip sprout two little branches that curve towards the branches on the other hand. So another circle, perpendicular to the one that your fingers are making, is almost completed. Just before those branches touch, two more little branches spring from the side of each of those little branches, and almost make another perpendicular circle, and so on. It never ends. 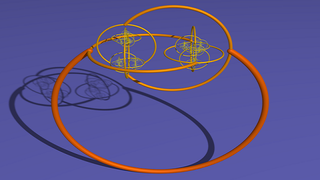 The Horned Sphere is used as an example of 'pathological' or 'wild' math, because of a seemingly paradoxical property. It's called a Horned Sphere because its insides behave like a sphere. Looking at the video, you can see it being stretched out of a sphere, and theoretically, every Horned Sphere could be pushed back into a ball. Everything 'inside' a Horned Sphere is inside one big, continuous, self-contained space. Getting just a little crazier, this is only even conceptually possible in a three dimensional universe. The Jordan Curve Theorem, showed that there is no single, enclosed curve that cannot carve a two-dimensional plane into an inside and an outside that mirror each other. It's only in the universe that we perceive that things can get more complicated than that. It's only in our reality that one spherical inside creating more than one outsides is possible. Via Wolfram Math World, Duke, and The Math Book.